Car insurance for SUVs offers a number of benefits in terms of financial support as well as vehicle assistance during an emergency. Also, as per the Motor Vehicles Act, it is mandatory in India for every vehicle owner to insure his/her vehicle with a third-party liability cover at least. Car insurance protects the car owner from third-party liabilities as well as own damage liabilities arising due to a mishap. This car insurance plan offers limited insurance coverage by covering only third-party liabilities arising due to a mishap. This car insurance plan offers extensive insurance coverage by covering third-party liabilities as well as own damage liabilities arising due to a mishap. You can visit a third-party insurance website or an insurer’s official website to purchase a car insurance or renew your existing insurance policy. You can also opt to purchase or renew car insurance offline by visiting the nearest branch office of the insurer or meeting with an insurance agent. Inform the insurer as soon as the mishap takes place and register your claim request. An authorised surveyor will be sent by the insurer to conduct a vehicle inspection and assess the total loss/damage incurred. You will have to submit the originals and copies of the necessary documents to the surveyor as requested, for the purpose of verification. In case of a cashless claim, take your car to the nearest authorised garage and get it fixed. The insurer will pay the garage directly for the repairs made. In case of a reimbursement claim, drive or get your car towed to the nearest garage and get it fixed. Once your car is fixed, pay the garage directly for the repairs made and submit the payment receipt to the insurer. The insurer will verify the receipt and reimburse the amount you spent on the repairs. IDV or Insured Declared Value is the maximum market value of your car at any given point in time with respect to its age. No Claim Bonus is the discount on insurance premium offered by the insurer to the insured for every claim-free year. What are the different deductibles in car insurance? There are two types of deductibles in car insurance, voluntary deductible and compulsory excess. A voluntary deductible is a part of the insured premium that you volunteer to pay at the time of claim settlement. A compulsory Excess is the part of the insured amount fixed by the insurer that you agree to pay during the claim settlement. 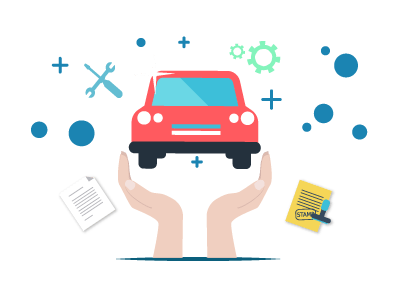 What is the tenure of a car insurance policy? A car insurance policy is valid for 12 months. Depreciation in car insurance is the loss in the market value of your car and is one of the factors that determine the IDV of your vehicle.